My mother was very excited about meeting the actress Brenda Bruce who Claude had engaged to play Mrs Dixon. She had arrived on 10th June whilst we were filming the fishing scene at Elterwater where she found Claude keeping up our moral by wearing my mother’s Donny Osmond hat. I think he needed it for warmth. It was unexpectedly cold. I can remember being worried that Brenda Bruce would be chilly as she was only wearing a blouse and flip-flops. Now I understand that she ‘was of a certain age’ and didn’t feel the cold quite so much as skinny twelve-year-olds with opinions. I shouldn’t have been worried about Mrs Dixon. She looked wonderful in the film – was wonderful – and very comfortable in her nice clean dairy. I had no idea that Brenda Bruce was so well-known, that BAFTA ~ the British Academy for Television Awards had named her Best Actress in 1963. “Yes, you do!” Mum said. “She was the White Queen in Alice Through the Looking Glass.” She’d actually worked for Claude quite a bit and he trusted her to play a small part well. 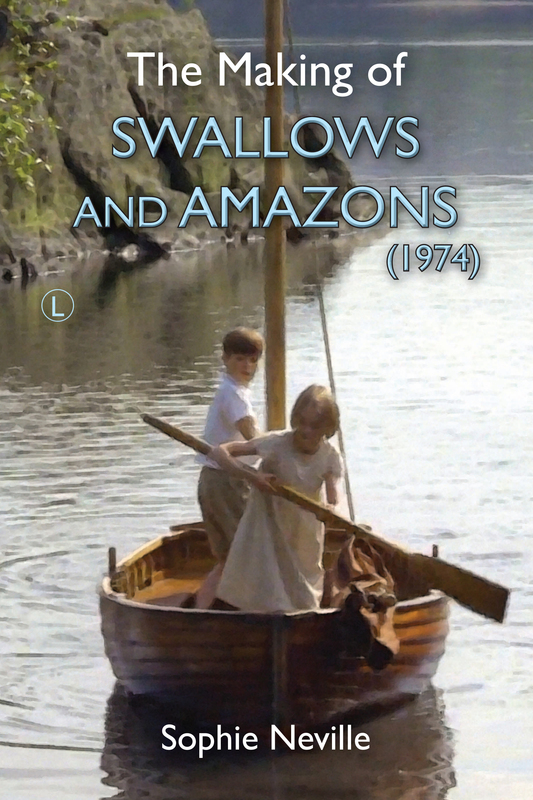 When I look back on Swallows and Amazons I can see that he made sure it didn’t become chocolate-boxy. You can tell by glancing at Mike Pratt’s costume. Mike Pratt who played Mr Dixon the provider of worms for our fishing bait, the lovely Lakeland colours of his garments contrasting with the harsh blues and reds of our 1970’s clothes. What Richard Pilbrow and Claude Whatham did want to make the most of was the Westmorland scenery. In many ways they were making a landscape movie. I think what they most enjoyed was finding all the locations to put together Arthur Ransome’s imaginary lake as depicted in the end pages of Swallows and Amazons and I am often asked where the waterfall is. “It must be Niagara!” No, Sophie. It’s somewhere near Elterwater. Kevin Burn sent me some suggestions with photos which made me feel pretty sure the actual waterfall is Skelwith Force. But Roger Wardale, who is an expert on Arthur Ransome’s locations, thinks not. “I don’t think it’s Skelwith Force which is more a series of rocky rapids in fairly level ground. I watched the film again yesterday and was reminded of the waterfall at Glen Mary (otherwise known as Tom Gill) the outlet for Tarn Hows dropping down to the Coniston-Ambleside road 4 miles from Skelwith Bridge.” So – any ideas most welcome! I remember Mike Pratt when he was in ‘Randall and Hopkirk deceased’, which I loved as a youngster! Kevin, I think it must have been Skelwith Force. It’s a beautiful waterfall – or cascade as the old farmers say. Yes, Mike Pratt was also in ‘Black Beauty’ which I loved. He was in the middle of making it in 1973 and couldn’t ahve his hari cut for ‘Swallows and Amazons’. Kevin – do you have nay idea where we filmed Dixon’s Farm? I don’t have the Call Sheet. All I know is that our tutor got terribly lost getting there. I don’t think it’s Skelwith Force which is more a series of rocky rapids in fairly level ground. I watched the film again yesterday and was reminded of the waterfall at Glen Mary (otherwise known as Tom Gill) the outlet for Tarn Hows dropping down to the Coniston-Ambleside road 4 miles from Skelwith Bridge. Hello Roger – aren’t you referring to Colwith Force with that description? I looked at the film last night too and thought it did look like Skelwith Force – I thought the children were standing on the rocks to the left of the falls (there is a picture of it on the link above). I’m quite happy to be corrected though! I tried to identify the location of the farm, but as Sherlock Holmes might say, there wasn’t a lot to go on. However, the scene where John walks from the lake to the farm with his bucket looks like Coniston, probably near Bank Ground Farm. (The lake, the houses on the other side and the shape of the hills in the distance suggest this). You have set me looking. . . Checking with an old 6 inch map and Baddeley, Skelwith Force has a total drop of only 5m, its attraction being its width and the volume of water— and of course it’s by a road. Colworth Force has a total drop of 60 ft, 17m or so but it is split in two by a large rock in two and not one deep cascade. I have a pic of Glen Mary that looks just right (to me) but I haven’t the skill to post it —I did try. (and there is good parking space off the road, by its foot). Dixon’s Farm has so few clues. It would make sense to use the most convenient . . .
Hi Roger – fair enough, you’re probably right. Also, I thought your name looked familiar – I have just realised I have one of your books, so you probably know the area better than me! (My main haunts are around Keswick, Ullswater and the N. Lakes generally, as I have a caravan up there). The scene at Dixon’s Farm could have been shot at the back of Bank Ground Farm. It was just odd that our tutor got lost as she would have been to Bank Ground before. I wondered whether the farm buildings might have been further up the road. For example on Google Maps there is a place referred to as Tent Lodge Cottage, which has similar looking buildings (and may have been a farm at the time, rather than a holiday place). Pure speculation on my part though! I had a long conversation once with Lucy Batty about her recollections of filming at Bank Ground in the house, barn, etc. She confirmed that they used the buildings that Kevin refers to – shown as Tent Lodge Cottages on Google Maps – as Dixon’s Farm. That certainly seems to fit from the view of the lake and shoreline trees in the background. Thank you for letting us know. As you can imagine, Mrs Batty did enjoy the filming! How is she doing? Thank you for that information. Isn’t Google Maps marvellous? I thought the sloping roof on one of the buildings looked a bit like the one in the film, so it is interesting to find out it is the right place!